Welcome to official website of the Postgraduate Annual Research on Informatics Seminar (PARIS 2018). This seminar was held on October 2018, at Universiti Teknologi Malaysia, Kuala Lumpur. PARIS 2018 aims to bring together academics, researchers, and postgraduate students in sharing their experiences, ideas, and research results in Informatics areas. 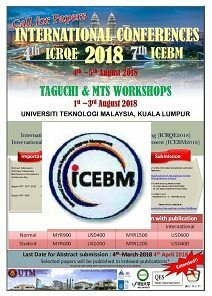 UTM Razak School of Engineering and Advanced Technology and Graduate School of Business Administration (GSBA), Meiji University, Tokyo, Japan are co-organizing the 7th International Conference on Engineering Business Management (ICEBM) 2018. The conference aims to provide a forum for academics, researchers and practitioners to exchange ideas and explore recent developments in the ﬁeld of Engineering, Business and Management. The conference is also expected to foster networking, collaboration and joint eﬀort among the conference participants to advance the theory and practice as well as to identify major trends and latest development in EBM. The conference provides dialogue platforms amongst researchers and industrial practitioners in the various subsets topic of biosignal processing, analysis and systems. In addition, there are many pre and post conference touring options in Kuching such as the river cruise, heritage sites, tropical rainforests and idyllic island resorts. Our first 2015 ICBAPS conference proceedings was successfully indexed in Scopus, ISI Web of Science and IEEE Xplore2015. Researchers and authors are invited to submit original high quality technical papers addressing innovative research in the broad field of biosignal processing, analysis and systems. 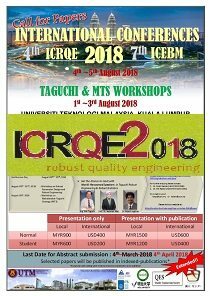 ICRQE2018 is the Fourth conference on Robust Quality Engineering which was previously organised by the Reliance Energy Management Institute held at Mumbai, India on 19 Jan 2017 to 21 Jan 2017. Researchers and authors are invited to submit original high quality technical papers addressing innovative research in the broad field of smart sensors and application. 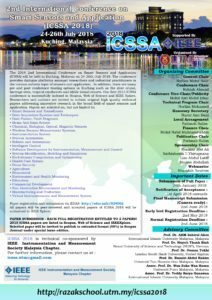 Our first 2015 ICSSA conference proceedings was successfully indexed in Scopus, Web of Science and IEEE Xplore2015. Researchers and participants are welcomed to join our conference to share their knowledge as well as enjoying the stay in Malaysia. 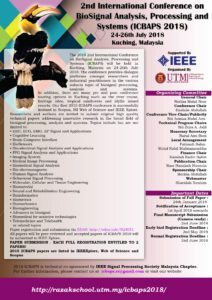 TAFGEN2018 is organised by Department Of Engineering, UTM RAZAK School of Engineering and Advanced Technology, Universiti Teknologi Malaysia (UTM), and technically co-sponsored by IEEE Malaysia Communication Society & Vehicular Technology Society Joint Chapter (ComSoc/VTS). 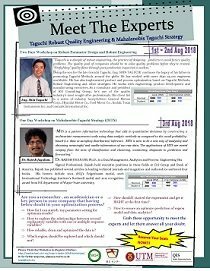 Accepted papers will be published in the TAFGEN 2018 Conference Proceedings and will be sent to IEEE Explore for publication approval. The proceedings will be submitted for indexing and available at major academic databases. Past TAFGEN 2015: Indexed by Scopus and Published in IEEEXplore.